Did you ever want to fully automate your XenApp 6.5 farm? Did you manage an automated unattended installation or image, but you are struggling to automate farm configurations? Would you like to learn how to create and configure load evaluators for XenApp 6.5 with PowerShell? In this case, this article is just for you. 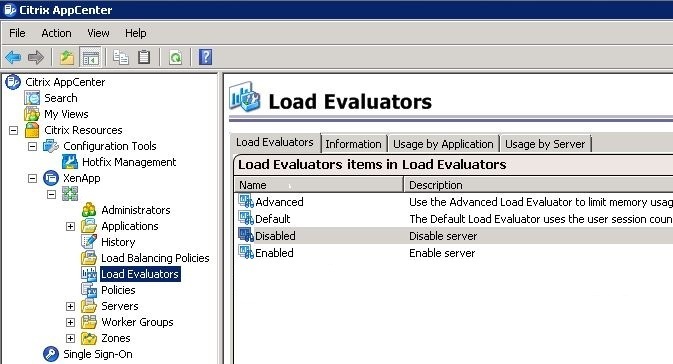 Citrix installs two load evaluators by default: Default and Advanced. Additional custom load evaluators are easily created using PowerShell. Specify the maximum application user load and the application name to which this setting applies (e.g. -ApplicationUserLoad 20 -ApplicationBrowserName "Notepad"). Enter two values: one where there is considered to be no load and one specifying the maximum load (e.g. -ContextSwitches 900,16000). Enter two values: one where there is considered to be no load and one specifying the maximum load (e.g. -CpuUtilization 10,90). Enter two values: one where there is considered to be no load and one specifying the maximum load (e.g. -DiskDataIO 0,32767). Enter two values: one where there is considered to be no load and one specifying the maximum load (e.g. -DiskOperations 0,100). IP ranges can be allowed and denied. To enter an IP range and set it to "allow" use the following parameters: -IPRanges 192.168.0.10-192.168.0.100 -IPRangesAllowed $True. To deny the same range use: -IPRanges 192.168.0.10-192.168.0.100 -IPRangesAllowed $False. Manage the impact of logon on the load. Possible values are Extreme, High, MediumHigh, Medium,and MediumLow. The default value is High. Configure a different value like this: -LoadThrottling MediumHigh. Enter two values: one where there is considered to be no load and one specifying the maximum load (e.g. -MemoryUsage 10,90). Enter two values: one where there is considered to be no load and one specifying the maximum load (e.g. -PageFaults 0,2000). Enter two values: one where there is considered to be no load and one specifying the maximum load (e.g. -PageSwaps 0,100). Set a scheduling rule when logons to the servers are permitted. The parameter must be specified using the format StartTime-EndTime. The times are specified in the 24-hour format HH:MM. For every day in the week a separate parameter exists. For example, to allow logons from Monday to Friday from 8 o'clock in the morning until 6 o'clock in the evening enter -MondaySchedule 08:00-18:00 -TuesdaySchedule 08:00-18:00 -WednesdaySchedule 08:00-18:00 -ThursdaySchedule 08:00-18:00 -FridaySchedule 08:00-18:00. The two remaining parameters are: -SaturdaySchedule and -SundaySchedule. Specify the maximum number of users which can be logged on to the Citrix server at the same time. For example: -ServerUserLoad 50. Did you know that you can use the scheduling option to disable a Citrix server? What you do is you create a load evaluator and add the scheduling option. Then set the logon times of each day to zero, which means that there is no allowed logon window for users. This basically disables the server since users are not allowed to logon at any time. Please be aware that this applies to the ICA protocol only! If standard users are allowed to connect to a Citrix server via RDP, which is not recommended, the new Citrix load evaluator will not prevent this. One other thing. The command New-XALoadEvaluator can only be used to create (and configure) a new load evaluator. To configure an existing load evaluator use the command Set-XALoadEvaluator. The following script creates two load evaluators, "Enabled" and "Disabled". The "Enabled" load evaluator configures the CPU and RAM utilization and Load Throttling. The "Disabled" load evaluator does not allow any logon times. # Task 1 of 2: Create and configure the load evaluator "Enabled"
# Task 2 of 2: Create and configure the load evaluator "Disabled"